If like me you weren't too keen on the Man of Steel movie, Grant Morrison's Superman -- Action Comics Vol. 2: Bulletproof is the tonic for that. The collection actually only a couple of regular Action Comics issues (thickened out with other material), but Morrison still succeeds in presenting what feels like a complete and detailed story, helped handily by a Silver Age aesthetic that's unafraid to gloss over the smaller details when necessary. Morrison's is a young, plucky Superman, well-meaning though still finding his way, and it's hard not be enamored with what Morrison creates here. The main story here, told in three issues, is two-fold -- Superman resolves to give up his compromised Clark Kent identity, and Earth's "First Superman" returns, warning of greater threats to come. Morrison successfully transitions from the first volume's cliffhanger as "Nimrod the Hunter" comes after Clark, but in a clever twist, Nimrod is foiled because Clark is already "dead," retired after a Metropolis mobster tries to blow Clark up. The second issue introduces Superman's "Johnny Clark" firefighter identity as Superman talks over events with Batman; it all comes to a head when the "First Superman" returns, and Batman and others compel Clark to retake his original identity. Morrison economizes the three issues perfectly; the Nimrod issue is essentially self-contained but it sets up well the second issue, which carries over into the third. Morrison skips over Clark's death and Superman's new identity with Silver Age aplomb (though Sholly Fisch handles some of the details in the included back-up stories); where other writers might need six issues to show the agony of Clark's decision, how he set up his new identity, and so on, Morrison's story zips right along, still with plenty of characterization and emotion. The Justice League appears here, unexpectedly, with Justice League: Origin having apparently happened somewhere between Action Vol. 1 and 2. 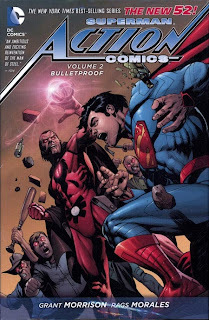 Morrison distinguishes between Superman on the streets of Metropolis and Superman with the League; for the former, Clark's still wearing his Superman T-shirts, and for the latter he suits up in his Superman armor. In this way, and in his interactions with the League, Superman comes off as younger than his compatriots in a way we haven't seen before; he's not the leader, but rather their junior wide-eyed idealist. When Superman goes to Batman for advice, Batman seems almost paternal (and this would fit with the New 52 continuity where apparently Batman's been operating much longer than the other heroes). Whether other creators, including those on the new Batman/Superman series, will preserve any of this is suspect, but it works well on Morrison's part, demonstrating a Superman in the early days of every part of his career. Though the "First Superman" is visually new, his backstory hews to that of the classic Captain Comet, giving the story a better resonance than if Morrison had just invented a new character whole cloth; it also makes the reader believe at least some of Comet's claims of good intentions even as he wreaks destruction in downtown Metropolis. (Artist Rags Morales's Comet also at times resembles Morales's Hourman, which is a nice throwback.) Via Comet, Morrison is as Morrison does, offering up psychic bullets and foreshadowing the arrival of the Multitude, evocative of Morrison's JLA-era apocalyptic threat Maggedon and perhaps also setting the stage for Morrison's Multiversity series. These three issues would be near perfect, except that series artist Rags Morales steps away at the crucial, climactic battle, and fill-in artist Brad Walker, though capable in his own right, just can't bring the necessary drama to the ending. I might have preferred to see CAFU in these parts; his fill-ins at the beginning of issue #12 and elsewhere are quite good, reminiscent of Carlos Pacheco, and I'd be happy to have seen CAFU stay on this book after Morrison's run. Other stories in this book include a single-issue focus on the black Superman of another dimension, with plenty of mentions again of Morrison's burgeoning multiverse. As with Action Comics's first volume, DC includes all the back-up stories here, which is great; some of them are more meaningful than others, but all fit in one way or another between the pages of the main story -- only, I might have liked it to be a bit clearer, as it was in the first book, where the main story stops and the back-ups begin. I was only slightly disappointed to find the Action Comics Annual #1 that finishes this volume written by Sholly Fisch instead of Morrison; I'd wanted more Morrison goodness, but Fisch does a fine job, especially handling Steel John Henry Irons. (Makes me wish DC had bucked celebrity and just put Fisch on Action after Morrison left.) Fisch reintroduces a classic Superman figure and at the same time makes him the new Kryponite Man; some threats from the first book still have their eyes on Superman, and I'm eager to see how it all comes together in the third book. It's a shame Grant Morrison departs Action Comics after the next volume. I had been skeptical whether Morrison's All-Star Superman beginnings would carry over well to Action Comics, but they do. Superman -- Action Comics Vol. 2: Bulletproof especially offers up some distinctly Silver Age-y storylines and villains that echo All-Star. To some extent the first Action Comics volume, Superman and the Men of Steel had a Golden Age tone; the second volume, the Silver Age; maybe in the third we'll see modern elements, bringing the young Superman fully into the New 52? Next week, more Before Watchmen and more! 1) Ferlin was originally mentioned as Mrs Nyxly's nephew a couple of issues, but then was her son in the later issues. They changed the nephew references here. 2) Mrs Nyxly also originally said she was using her first of three wishes to fix things for Clark, but later she said it was her second. Again, they fixed in this collection to match. Unsurprisingly, I loved this book, but I thought the President Superman/Super-Doomsday story was the best thing about it. It's a great example of how many themes and ideas Morrison can pack in a single issue, with gorgeous art by Gene Ha. The main 3-parter was excellent, too, in spite of Morales's incapability of drawing two consecutive issues by himself. "If like me you weren't too keen on the Man of Steel movie, Grant Morrison's Superman -- Action Comics Vol. 2: Bulletproof is the tonic for that." And for those of us who've never liked Morrison's (inexplicably well-regarded) Silver Age pastiche, the "Man of Steel" movie was the perfect tonic for that. Great insight on the Golden/Silver Age divides! Reading it in floppies, I hadn't noticed that trend (though it's absolutely there); I think you'll be happy with the way the final trade brings Superman into the Modern Age/New 52. That Gene Ha issue is great, one of my favorite single issues of that year. Looking forward to how that ties in with Multiversity whenever we see that.